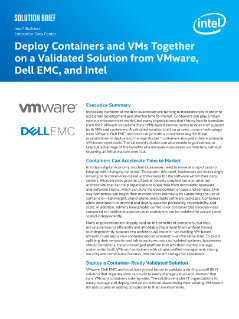 A validated solution built from VMware, Dell EMC, and Intel lets organizations deploy and manage Docker* containers alongside traditional, VM-based workloads. The solution can also enable organizations to take full advantage of the benefits of a microservices-based architecture, without requiring an infrastructure overhaul. Informieren Sie sich über die wichtigsten Trends der IT-Transformation und erfahren Sie, welche Argumente für eine Modernisierung der IT-Infrastruktur sprechen. Ist Ihr Unternehmen bereit für KI?